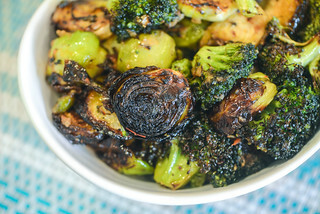 It's been over a year since my last recipe post, and what do I go and do for the first post returning this blog to form, toss out the grill and take to the fryer! 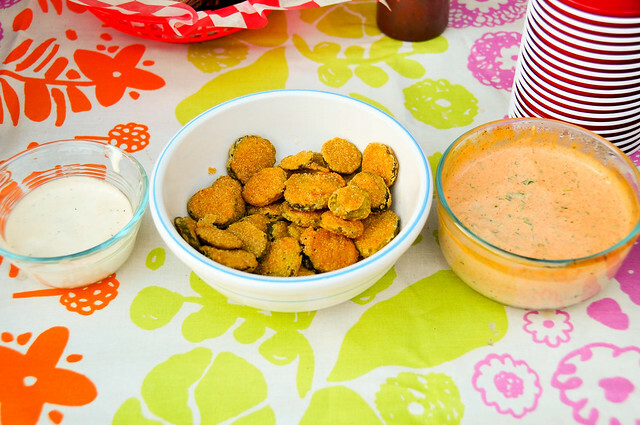 Don't worry, barbecue and grilling is on the menu, but I recently let you Meatwavers decide what you would like to see at the Meatwave, and a side of fried pickles was unanimously choosen, with one loyal reader asking to see the process. In the interest of giving the people what they want, I proudly present to you the fried pickle. Admittedly, I'm a newbie to fried pickles and only found a true love for them after spending time at The Best in the West: Nugget Rib Cook-off in Sparks, Nevada, where my gracious host Amy Mills from 17th St Bar & Grill let me in on their pickle frying process. Intrigued and wowed by the sheer deliciousness of them, I knew they had be made in my kitchen as soon as possible. The first step to pickle nirvana was finding the right pickle. 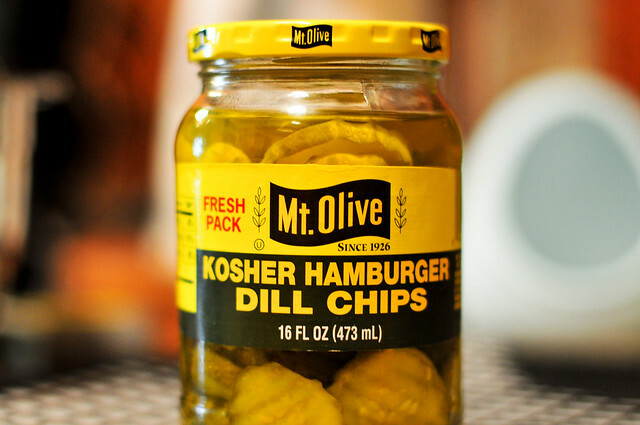 The amount of choices of pickles at the grocery made my head spin, and so I focused on only the dill chips, and picked up a few bottles of different brands. My favorite of them ended up being this jar from Mt. Olive, which may partly be because I really dig the design of their labels, so much more class than the Vlasic bird. Next came the batter. Thanks to being a member of a CSA, I've become well versed in making fried green tomatoes, and it seemed like the batter for those would translate perfectly for pickles. It's a dry mix of about 2 parts flour to 1 part cornmeal with some paprika and cayenne pepper added in. The pickles were drained and put directly into the batter, with the pickle brine providing enough moisture to hold a good layer of batter on. Then into a dutch oven filled with 350 degree peanut oil to brown, which only took about 2 minutes. Transferring the pickles to a rack to cool was the most dangerous part, because from here I couldn't stop myself from popping one after another, causing a slight burn on my tongue and lessening the amount of fried pickles that made it out of the kitchen for others to enjoy. It was too hard to resist though, they were so insanely delicious; slightly sour with a crisp, grainy crust that was just the perfect compliment. The really were like crack, as one Meatwaver warned me. What did make it to the table went fast, which is good, because these are best hot. I served them with two choices of dipping sauce: ranch out of the bottle and a homemade remoulade. Both dippers were well received, and there was a clear division of preference (Trouble in paradise: I side with the remoulade, while the wife swears by the ranch). I should let Meatwavers decide the menus of all future Meatwaves, because they sure knew what they were doing when voting for these. One of the best sides to cross our plates, they're sure to become a staple from now on, which may just open the Meatwave to further explorations in world of frying. Are you all prepared that? 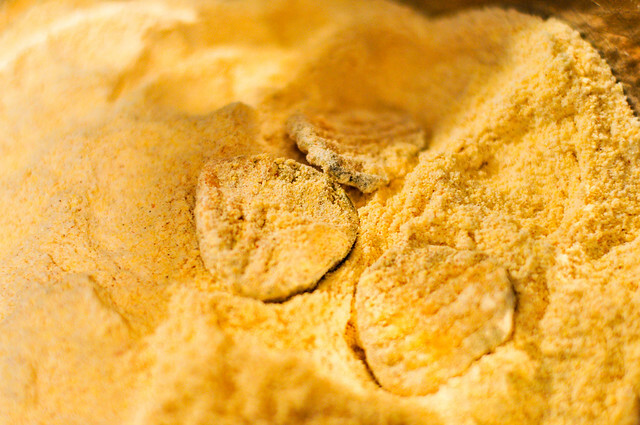 1.Whisk together flour, cornmeal, paprika, and cayenne in a large bowl and set aside. 2. Fill a large dutch oven with about 2 inches of oil and heat over medium-high heat until the oil reached 350 degrees. 3. Strain liquid from pickles in a fine mesh strainer or colander. 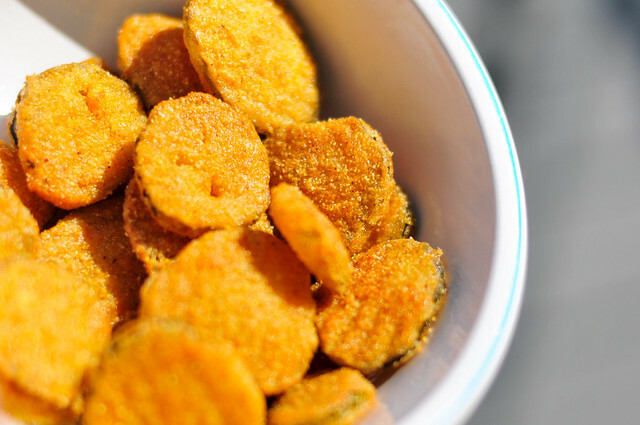 Place the pickles in the flour/cornmeal mixture and toss to coat evenly. 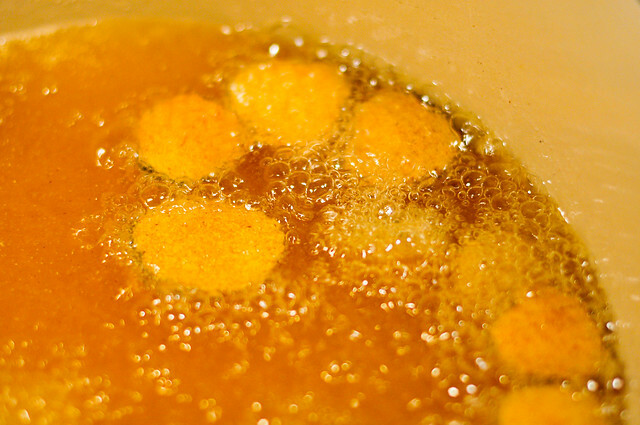 Remove the pickles from the mixture, shaking off excess batter, and place in the hot oil. Fry until golden brown, about 2 minutes. Remove the pickles from the oil to a paper towel lined plate or a wire rack set above a paper towel lined baking sheet. 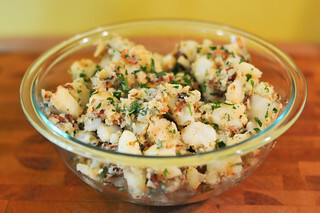 Let cool for 30-60 seconds, then serve immediately with ranch dressing and/or a remoulade. I really enjoyed this post but not as much as I am going to enjoy making them myself. These are one of my youngest son's favorites. When I first hear "fried pickled" at Hooters years ago, I thought it was a joke but dang those things are addictive. 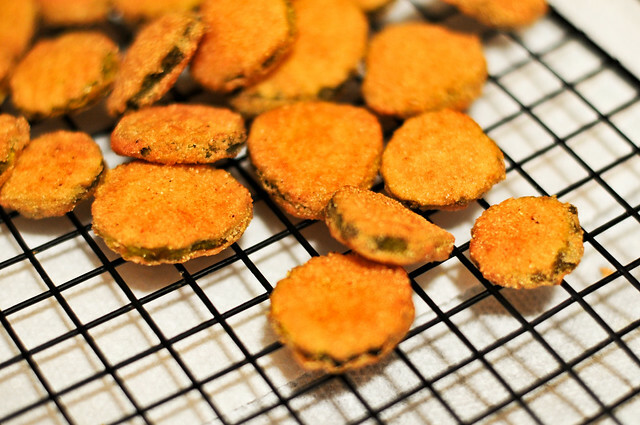 Fried pickles looks dirty. But great. Please can we have some more content! I have never heard of fried pickles either. Where have they been hiding all this time? I have been a foodie for as long as I can remember and have not had any of those lovely little crispy yummies. I got to try them real soon! 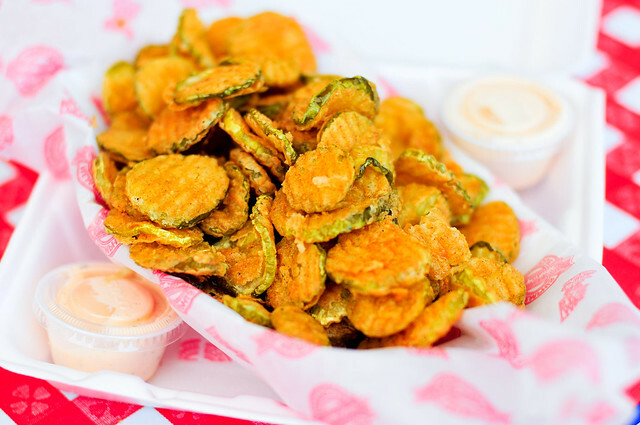 17th Street's Fried Pickles are AWESOME! The remoulade sauce is perfect for them. 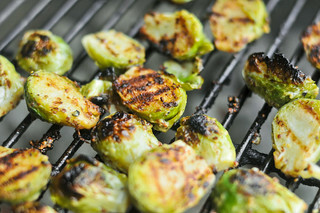 Seriously, you can make an entire meal of these little guys!